With fall being such a popular time of year to visit Lancaster County, I thought a PA Dutch Lingo-Lesson would be a good idea. No, we’re not talking about the latest dance craze! The locals here in Lancaster County have a distinct dialect, much like other regions of the U.S. such as the deep south or Louisiana’s Cajun country. 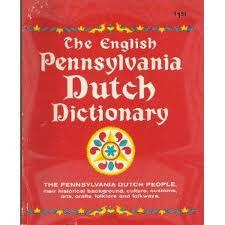 The dialect in this area is often referred to as “Dutchy” (makes sense!) . Here are a few phrases to help you along when you encounter the locals! The phrase “here nah” doesn’t mean a whole lot, just something to dress up the end of the sentence when delivered in a melodic manner. Translation: When are you coming to Lancaster County? “Yous” is a word that gets a lot of play here… basically it’s he equivalent to “ya’ll”. “Throw Father down the stairs his hat!” and “Throw the cow over the fence some hay!”. They’re good demonstrations of the difference in grammar and word order in the local dialect. Neither father nor the cow are being thrown anywhere… thank goodness! If you ask your waitress about the steak special and she says, “I’m so sorry, it’s all.” Translation: All gone. You’re waiting for your breakfast to arrive and you hear, “Do yous want some coffee awhile? Translation: While you wait. “Don’t forget to outen the light.” Translation: Turn out the light. “What for chairs do you want?” Translation: What do you want those chairs for? “The hurrier I go, the behinder I get.” Translation? I won’ner, can you figure that one out without the translation?! Translation: When you’re in the area, drop by, and fill up on the Smithton Inn’s delicious breakfasts! !